Black Ops 4 – Infected, Skill Divisions & more! 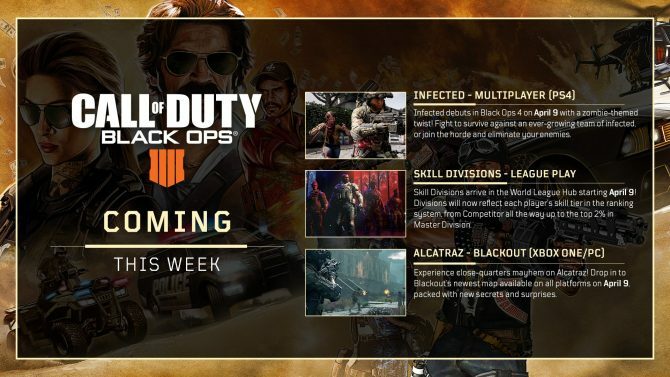 Treyarch has announced what to expect in Call of Duty Black Ops 4 for the week of April 9th, 2019. The major highlight here is Infected will finally make it’s way to Multiplayer on PS4. The classic MP mode pits you against infected enemies with a new twist. Rather than just turn into regular soldiers with knifes when infected, your character will now be a zombie! Alcatraz – Blackout (Xbox One/PC): Experience close-quarters mayhem on Alcatraz! Drop in to Blackout’s newest map available on all platforms on April 9 packed with new secrets and surprises.